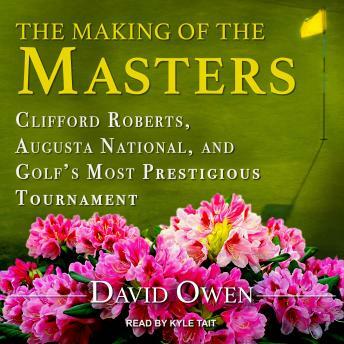 Listen to "The Making of the Masters: Clifford Roberts, Augusta National, and Golf's Most Prestigious Tournament" on your iOS and Android device. The Masters. For any golf fan, the words evoke the immortal greats of the game and their quest for the most prized trophy of all-the green jacket of Augusta National Golf Club. But behind the legendary links and timeless traditions is one of the most overlooked and misunderstood figures in the history of the Masters and Augusta National: Clifford Roberts, the club's chairman from its founding in 1931 until shortly before his death in 1977. Roberts's meticulous attention to detail, his firm authoritarian hand, and his refusal to settle-even for perfection-helped build the Masters into the tournament it is today, and Augusta National into every golfer's idea of heaven on earth.